The History Museum is one of the best of Warsaw's impressive array of museums. Its three storeys are crammed with fascinating exhibitions, covering every aspect of Warsaw's history and life from the city's establishment to the present day. The museum was founded in 1936 and reopened in 1948 after closing during the war. It now occupies almost an entire side of a square in Old Town, housed in quaint historical buildings and boasting 52 rooms with permanent exhibitions, four with temporary exhibitions, a cinema, a library and a reading room. One of the highlights is the collection of old photographs, clippings and articles on display from everyday pre-war city life. Another special feature is a documentary film showing the destruction and reconstruction of the city, with footage shot by the Nazis during their calculated and systematic annihilation of Warsaw, and footage of the careful rebuilding after the war. The film is shown in English at 10am and 12pm from Tuesday to Friday, and at 12pm and 2pm on Saturday and Sunday. 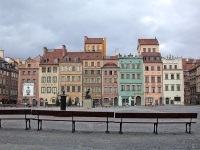 Address: Rynek Starego Miasta 28-42, 00-272 Warszawa, Poland. Opening times: 10am to 6pm, Tuesday to Sunday.